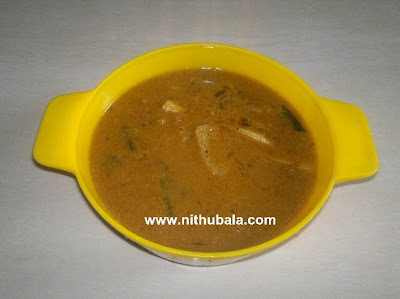 Ennai Vazhakkai Kuzhambu or Malli Vazhakkai Kuzhambu is a very unique and delicious Kuzhambu. This is my MIL's Signature Dish. Heat oil. Throw all the ingredients one by one. Roast them all together in a low flame until dhal and coconut gratings turn golden brown. Heat oil. Splutter mustard. Throw curry leaves. Switch off the stove. 1. In a pan, heat oil. Add plantain pieces. Medium the flame. Fry well, till the plantain turns crisp. 2. Now, add turmeric powder, asafoetida, salt and tamarind juice. Turn the flame to high. Let the contents boil well. 3. Add the spice powder and jaggery. Stir once. 4. Allow the contents to thicken in medium flame. 5. Pour the tempering. Mix once. Switch off the stove. This looks very delicious...All i need a is a bowl of rice for a blissful meal!! delicious awesome and tempting kuzhambu. That is so tasty Nithu, I am about to post my version of kali today. Love this fingerlicking flavourful kuzhambu. that is so tongue tickling and sooo lipsmacking!!! bookmarking it! !